The high-ranking 10th-century courtier Minamoto no Tsunemoto was known for his excellent skills as a poet and an archer. Standing with his back turned to the viewers, Tsunemoto is shown here executing one of his heroic acts. 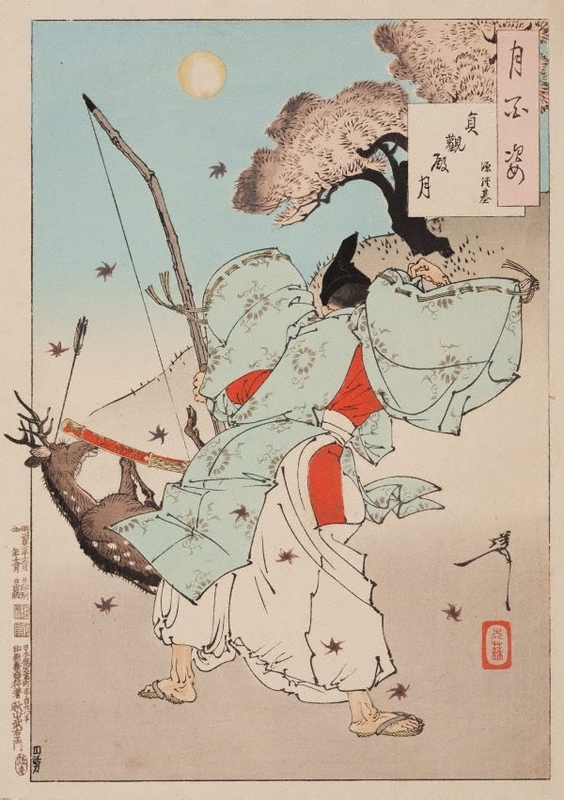 One autumn night in 932, as Emperor Shujaku was strolling in the garden in the Jōganden wing of the imperial palace in Kyoto, a demon taking the shape of a giant deer appeared on the roof and prepared to leap on the emperor. Tsunemoto, who was present, killed the beast with a single ‘turnip-headed’ arrow between the eyes.